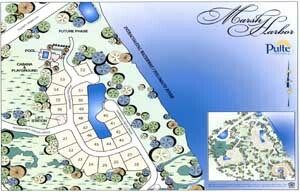 Marsh Harbor Community in Ponte Vedra Beach, Florida. Marsh Harbor is a new luxury gated residential community by Pulte Homes located near Intracoastal in the Ponte Vedra Beach area. Marsh Harbor features newly designed homes that offer 4 and 5 bedrooms with 2 and 3 car garages, grand double 8' entry, magnificent views of marsh and nature preserve, sparkling pool, cabana, party kitchen, meeting room and playground. Make sure to call me to view homes in this community, I can represent you as a buyer's agent at no cost. Saltmeadow features bonus/game room, separate living and dining areas, private library and ample extra storage on the second floor. Owner's suite is an oasis of privacy. Oyster Bay, at 4,029 square feet, is the largest floor plan at Marsh Harbor. Many incredible features elegant see-through fireplace creating separate living and dining areas and a large, attached 3-car garage.